On Sunday, November 25, Russian border guards opened fire on three Ukrainian ships off the Crimean Peninsula. They then seized their crews and further agitated tensions between the two European countries. According to the Ukrainian government, the Russian guards confronted the Ukrainian vessels and sparked a “lengthy standoff” that resulted in the Russians ramming into the other country’s ships before taking the crews and departing from the scene. The incident occurred on the Kerch Strait, which separates Russia from Crimea and connects the Black Sea to the Sea of Azov. Crimea is a territory that Russia controls, albeit one that international parties recognize as a part of Ukraine. Tensions have been particularly high since the Soviet Union’s collapse and the formation of the Russian Federation in the 1990’s, with each country acting hostile toward the other on multiple occasions. 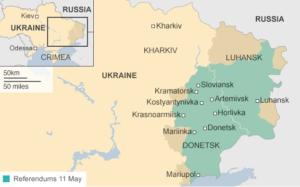 In 2014, conflict broke out as a Russian-back rebel army battled the Ukrainian army in eastern Ukraine. They agreed on a cease-fire in 2015, but Ukraine later ceased diplomatic relations with Russia and advised that none of its citizens visit the other country for any reason. Pursuant to a 2003 agreement, both Russia and Ukraine are free to move in the Kerch Strait as they wish. However, Russia claims that Ukraine was in fact trespassing into their own waters, although Ukraine disproved this argument with a map of the locations of each vessel. Further, Russia argues that Ukraine organized the clash to provoke the Russians ahead of Ukraine’s upcoming presidential election. Petro Poroshenko, president of Ukraine, ordered martial law across the country’s borders for a thirty-day period. Additionally, he enforced restrictions on Russians living in Ukraine in a myriad of aspects, including bank withdrawals and international travel, as well as requesting that NATO send ships to the area of conflict. However, Russia challenged the country’s usage of martial law over a “border incident.” Because Ukraine did not impose martial law during past conflicts that they believe to be more extreme, the Russian government views this decision as unnecessary and overly dramatic. Regardless, German Chancellor Angela Merkel places all blame regarding the incident on Russia. Specifically, Merkel accused Russia, particularly its president, Vladimir Putin, of violating the aforementioned 2003 agreement by building a bridge over the Kerch Strait that limited access to the Sea of Azov. Even though Ukraine wishes for NATO to involve itself in the issue, Merkel does not believe that military involvement will do anything beyond increasing tensions. This is because no military ship can enter Russia’s and Ukraine’s shared waters without the consent of both countries, and it is highly unlikely that Russia will welcome NATO into the territory. United States President Donald Trump also inserted himself in the issue, electing to cancel his December 1 meeting with Vladimir Putin at the G20 summit. At the time that this article was written, the G20 had not yet started. However, tensions between Russia and Ukraine were set to be a topic of interest at the summit.